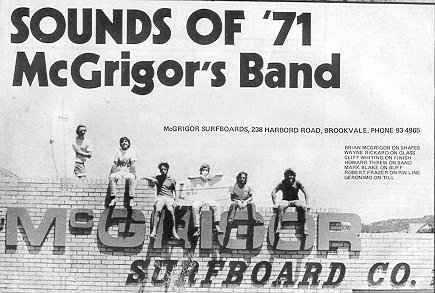 1971 McGrigor Diamond tail Tri-fin 6 ft 8"
Foam blank, 1/4" redwood stringer, Volan glassed with tint. Narrow rail lap on bottom. Post production two wide base side fins 2 1/2" x 2 1/2" @ 12 1/4 inches - white. Green laminated tint with diminished dark rail overlap. Blue hand-painted Peace Symbol , bottom tail. In Australia this design had a short but well publicised life circa 1971-1972. Following the experimentation with the Twin fin 1, several designers used variations of tri-fin configurations. The rail fins were usually small and long based, the inside often foiled flat. Position varied enormously from behind to well in front of the central fin. This early experimentation established that the board would track and be "stiffer" if the rail fins were behind the centre fin, with the rail fins forward of the centre fin the board would be more manoeuvrable, or "looser." 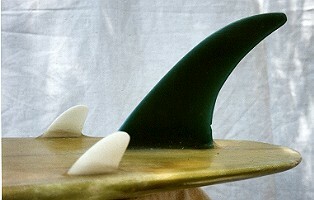 Narrowing the angle of attack and tipping out of the side fins was a progressive process that produced the Cambell Bros.' Bonzer, (1973); a combined fin and bottom design based on Ruellego Delta designs. The Tri fin was to reach its peak with the development of Simon Anderson's Thruster (1981) design, placing three similar fins at the tail extremities to maximise manoeuvrability in small waves. It was subsequently found to superior to all previous designs. The Best of Tracks 1973 - factory photo, below. Surfing World magazine Vol 16 # 1 1972. The board has a diminished rail lap on the bottom to reduce weight. Surfing World Magazine Volume 14 Number 4 Pages 69 - 70. Extensive water staining has bleached much of the laminated tint. From... Mike Davis :Design Through Development in The Best of Tracks 1973. Text reads : on shapes. on glass, on finish, on sand, on buff, on pinline, Geronimo on till. Geoff Cater (2001 - 2017) : McGrigor Tri-fin, 1971, 6ft 8".